[a 175-page] authentic screenplay written by Bhargava, who is also famous as the creator of Kittu, an animation feature film made in Telugu. Till date (sic. ), Bhargava has produced five feature films under his banner Bhargava Pictures. 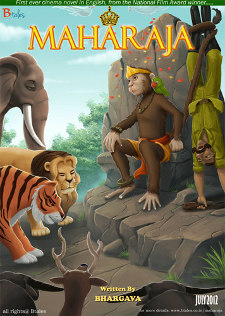 The story circles around the adventures of a young dynamic, bold, helpful, intelligent, honest & smart monkey, Nandu, who dreams to become king of the jungle by changing the forest laws. Nandu stands up for the new generation and hints that its time to change the rules and take charge. Other Characters include Rudra, a good natured Lion King, Deva, son of the Lion king, who strongly believes that he is the natural king and born to rule, Mola, a crocodile and the king of the water animals (kingdom of the water), Sampathi, a vulture, the king of the birds (kingdom of the sky) and Kansa, a human being, who has a chemical factory adjacent to forest which was built illegally and also who encroaches the forest land and wants to build an entertainment hub in the forest area. Cinema novel follows a screenplay narration style, less verbose and fast paced which makes the readers entertained more while they read and it becomes easy to visualize the scene as if they are watching a film. The intention behind generating a Cinema Novel is to bring to the audience a refreshing and rare way of demonstrating a story. Maharaja is aimed at children from 5 to 15. Um – and this differs from a comic book, how? Btales aspires to sell around one million copies of Maharaja in a year. Also, the book will release in all Major Indian Languages and International languages, French, German & Arabic at a later stage & also be sent to the major literary festivals and forums. Maharaja shall also set its stand as a full length CG Animated Feature Film, Television Series, Games & exclusive Merchandises of its engaging characters. Somehow I cannot imagine Maharaja the cinema novel becoming a big hit in America, but who knows? As a CGI animated feature, TV series, or video game, its chances will probably be better. Is the artist credited, or is this Bharavi person the artist as well. In any case, I like the cover art. No, the story in Animation Xpress (which reads like an uncritical press release) emphasizes that Bhargava is the WRITER of Maharaja, also referred to as the scripter. So I assume that he is not the artist. Bharavi is the head of BTales, and described as its founder/writer and animation director, so I assume that the artist is a BTales staff artist. There is remarkably little information on the Internet about Kittu, Bhargava's earlier animation feature. Wikipedia says that it was released in 2006, is about 125 minutes long, and gives Bhargava's full name as Bhargava Kodavanti. There is one online article on a website for movies in the Telugu language that shows Kittu's poster, and gives a synopsis that makes clear that Kittu is a "monkey boy" and that this is an anthropomorphic animated movie. If it is only in Telugu, I do not imagine that it has been seen by many outside of the relatively-small Telugu-speaking area of India. Almost all of the Indian animated features covered on Flayrah have been in Hindi, the majority language.